Emilio Portal is an indigenous artist with Peruvian and French ancestry. He asks this important question in islands. As part of his 11 month residency as Aboriginal Curator at Open Space, Peter Morin invited guest artist Emilio Portal to present a solo exhibition. Emilio’s unfolding performance-based installation featured in this blog-page is called islands. 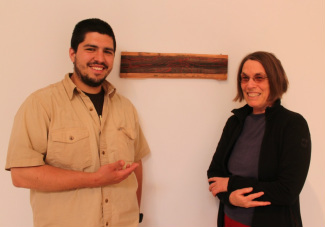 Emilio, a recent MFA grad from UVic, honours local Lekwungen peoples of Vancouver Island. As a guest on the territory, he is gathering images, ideas and stories that relate to contested land issues. Within the dialogue is a invitation to witness the past, negotiate the present and reinvent the future, notes Curator Morin. imaged walking in a old growth forest. “A small delicate breeze made the foliage dance,” he recalls. Emilio’s artistic process is intuitive, an act of playing and discovering, of working with the cedar medium. His intent is to honour the spiritual connections of this place and long-held traditions of the Lekwungen people. “The spiritual essence of red cedar is intertwined with all life forms,” says Emilio. The artist chose cedar because of its essential role in sustaining coastal cultures over many centuries. Used for shelter, clothing, baskets, cookware, ceremonial masks and poles, cedar was revered as a living being that offered itself to humanity, explains Emilio. Cedar also has a deep connection to fire, as it ignites quickly and burns well. pertaining to land use issues. These photos are printed on 12x18 in paper and reworked with original text. Above is a photo of a statue found in the inner harbour. The artist has added in red pencil: the blood and spirits of the ancestors live in the forests the land the air the water our breaths our heartbeats the essence of all creation. Also in the inner harbour is a monument showing an 1825 boundary line imposed by Britain and Russia to resolve disputes over sea otter resources. The artist’s comments add a revered perspective to the political issues: sacred protectors of this land and water and spirit. On the receipt of that letter I summoned to the conference, the chiefs and influential men of the Songees Tribe, which inhabits and claims the District of Victoria, from Gordon Head to Arro Strait to Point Albert on the Strait of De Fuca as their own particular heritage... Paid the sum of 75 Pounds on April 30, 1850 (6,450 pounds in 2011). 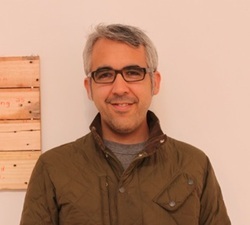 Emilio Portal’s artist statement also conveys spiritual process. He says: Art is a personal ceremony of honouring the world and being honoured in return. When making art, i am constantly faced with wordless mystery, not knowing the next step intellectually. It is in this space that i learn something of the world, and the world of me. Photo taken through crack in Big House doorway. This movement throughout time from a period of balance to a period of decay is not a linear story, but is a cyclical one that will return to a balanced state. For this to occur, a shift must happen. This shift is not solely a human shift, but an entire universal shift: a divine revolution. We, as human beings, do not lead the world. as A Living Collection. Emilio responds with the message: things - sentient beings that are alive cannot be collected for the profit of a few without repercussions. "For Indigenous peoples, totems represent the primal power of pure beginning, and carry a potent energy. This energy moves outside of political boundaries and cannot be contained or collected." The artist believes that totems should reside with their original owners. After the performance, Aboriginal Curator in Residence Peter Morin thanked the staff and volunteers at Open Space for hosting the transformative islands project. Peter expressed his gratitude to Emilio for fine-tuning our sensitivities to the original inhabitants of this area. The loss of language and culture suffered by Indigenous groups continues to adversely affect local populations, explained the curator. Creating awareness of current issues is an important precursor to change. Morin and Elder Gerry Ambers led an intensive Circle Ceremony. People gathered to share personal truths and perspectives on being a guest on Coast Salish territories. Tuesday June 26, 7 PM. Guests at the closing ceremony of islands heard an original, improv drumming performance by Emilio. He used a drum kit and cymbals as well as several homemade percussive instruments: bamboo wind chimes, a recycled tomato sauce can, African djun djun drums and a cajon box drum from Peru. The musician crawled inside a square structure and was not visible to the audience. The sounds became an inner journey of discovery, both mysterious and mesmerizing. "I believe our purpose is to honour the world, and in doing so, the world honours us. The intention in my art practice is to honour every place that i might go to, every one that i might come into contact with, and the phenomenon and mystery of relationship itself." Helen Marzolf, Director of Open Space found the islands installation a unique and ever-changing environment. “I will miss the invigorating smell of cedar,” she says. The Director is pleased that four groups assembled within Emilio's shape shifting installation: Chris Creighton Kelly and France Trepanier launched their report Understanding Aboriginal Art in Canada Today: A Knowledge and Literature Review; JackPine Press (Saskatoon) launched a new triad of publications and Peter Morin and Elder Gerry Ambers led two Circle Ceremonies. "Emilio's project embraced these get-togethers," says Helen, "and invited me to rethink notions of place." Tues-Sat 12-5 PM. 250 383-8833.
certificate from the University of Victoria. For ten years, she operated an art & framing shop.